The Patriots steamrolled their way to a 3-0 record with a 51-17 demolition of the Jacksonville Jaguars on Sunday afternoon, as New England put in another surgical performance heading into their bye week. What else is there to say other than this wasn't a challenge in the least for the boys in blue? New England showed that the Jags don't belong in the same conversation - hell the same footballing universe - as they do. Brady was again brilliant, as were Rob Gronkowski and Julian Edelman, the offense as a whole was pristine, and the defense smothered an undermanned and weak Jags offense led by Blake Bortles. There were of course some hiccups throughout the day, but save for a handful of errors, it was a perfect day for the Pats. 33 completions, 358 passing yards, two touchdowns, a 118.1 QB rating, oh, and a career milestone. Tom Brady was nails yet again, as he was in the first two weeks of the season. Brady shredded a Jaguars defense that was begging to be let off the hook as TB12 marched down the field drive after drive after drive. On the season, Brady leads the NFL in total completions (96), attempts (133), yards (1,112), touchdowns (9) and yards/game (370.7). And the sickest part is, you know he's not even close to being satisfied with his results thus far. After serving his one-game suspension in Week 1 and failing to make an impact in Week 2, LeGarrette Blount showed up big time when he was able to chew up the clock late in the contest (18 carries, 78 yards) while also finding the end zone three separate times. Dion Lewis cooled off a bit from his pace in the first two weeks with a balanced 67-yard performance - 37 on the ground, 30 through the air - but he did find the end zone for the game's opening score. James White factored into the game for the first time this season, as the shifty back caught four balls for 26 yards while also picking up eight yards on the ground. 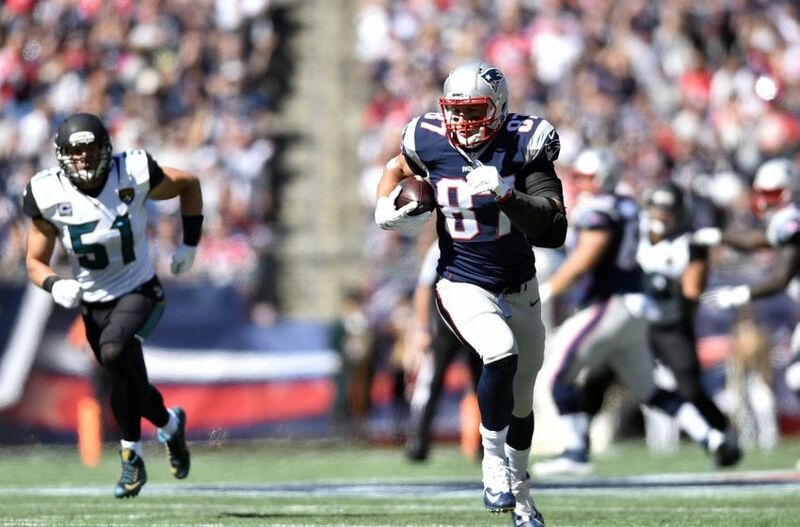 Rob Gronkowski caught four balls on seven targets for 101 yards but failed to find the end zone on the day. He was also whistled for two offensive PI calls, even if the first one was totally bogus. There was also the ball he dropped on 3rd-and-goal late in the second quarter, which forced the team to settle for a field goal. Scott Chandler caught both balls thrown his way for 25 yards after dropping back-to-back would-be touchdowns last week in Buffalo. Julian Edelman again led the way with eight catches on 11 targets for 85 yards, while Danny Amendola chipped in with five catches for 39 yards and was the recipient of Brady's 400th touchdown toss. The newly-acquired Keshawn Martin hauled in Brady's 401st while finishing with three catches for 33 yards. Aaron Dobson regressed from his performance against the Bills when he caught just one pass on three targets and was bailed out significantly when officials whistled Peyton Thompson for a 52-yard DPI when Dobson flat dropped Brady's bomb down the middle. Playing again with three rookies in the interior and a rotation through the game, the O-Line kept the Jaguars front at bay, yielding only two sacks against. Through three games, the Patriots have allowed only six sacks (15th best in the league) and 15 total QB hits (12th best). Rookie center David Andrews is the only player on the roster to have played every snap thus far this season, and he's stepping in for the injured Bryan Stork as good as anyone could've hoped for. Blake Bortles was sacked only twice on the day, although Jamie Collins did strip him for a fumble that was recovered by the Jags in the wackiest play of the day. Dominique Easley and Jabaal Sheard were pushing the pocket and forced Bortles to throw on the run under duress, something he didn't do all that well. Chandler Jones finished with just two total tackles. Sheard and Rob Ninkovich each picked up a QB hit, but for an offensive line that isn't exactly the best in the NFL, it would've been nice to see some more pressure put on the QB. Jamie Collins and Dont'a Hightower were excellent overall, especially in coverage, while Collins finished with five total tackles and the aforementioned forced fumble. Jerod Mayo again saw limited time in the contest, similar to how the team has been handling his play in the first two weeks of the season. Devin McCourty picked off Bortles for the only turnover of the game, showing great range and instincts to read the QB's eyes, streak across the field and snag the ball before returning it 27 yards. Malcom Butler was great in coverage, with one blemish coming when he was beat by Allen Hurns on a 59-yard touchdown scamper in the third and when he dropped a sure interception in the second quarter. Rookies Jordan Richards (two tackles, one PBU) and Justin Coleman (three tackles)saw their first action of the season and put in some great work. Punter Ryan Allen got the day off and Stephen Gostkowski was automatic as usual, drilling three field goals of 46, 20 and 46 yards. He also broke the NFL record by converting his 423rd-consecutive extra point attempt, a mark that, with the new rules changes now in place, won't ever be broken. Not much to see other than New England's staff being better prepared, more detailed and having the luxury of coaching better talent than the Jaguars. For the most part, the Patriots played the game straight-up, with the heavy utilization of screens and the short passing game for Brady and the offense being the exception. Towards the end of the game, it was handoffs to Blount looking to eat up the clock and gain yardage. The three touchdowns scored were a simple result of a gassed out defense wanting to be anywhere but the Gillette Stadium turf.